The beaches, forests and wildlife of Washington's Camano Island offer a treasure-trove of natural beauty and endless recreational possibilities. English Boom Historical Park was once a bustling center for logging and is now a peaceful spot with its uplands, salt marsh, shoreline and tidelands. Davis Slough is named after Reuben Davis, who lived on Camano Island before 1880 and was the oldest settler in the area. The island has historically been used by Native Americans, loggers, farmers and fishermen alike but today is enjoyed by Camano Islanders, who have worked hard to protect and preserve the island's cherished nature sites. 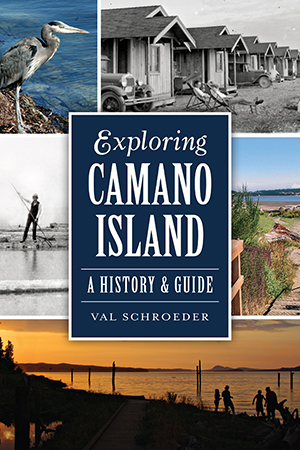 Discover Camano Island with author Val Schroeder as she takes readers on a trek around the location's best-preserved features while uncovering the unique history behind them. Val Schroeder teaches at Stanwood High School where she has served as newspaper and yearbook advisor. Val has worked as a stringer for the Stanwood Camano News, a staff writer for American Adventures and AJW Publishing, and an outreach coordinator for Washington Trails Association. She volunteers as a public relations coordinator for Pilchuck Wildlife Center and Friends of Camano Island Parks, and is a founder and coordinator of the Camano Wildlife Habitat Project.